If you want the smoothest operating door system, the life and slide patio door system is the answer. The engineering design of the lift and slide system utilize a compression gasket at the bottom of the door for a water-tight seal when the door is closed. With a turn of the handle, the door is raised up on tandem ball bearing wheel system for the smoothest ride in the industry. Fingertip pressure is all that is required to move the doors. The most popular feature of these doors is the availability of a “flush” sill condition to delete the normal track riser that is required on traditional sliding door systems. Contact the experts at HBS to see which product is right for your project. With H.B.S., Inc., you’ll benefit from the tight relationships we have with our manufacturers. You won’t get this advantage from a lumberyard. We represent the highest end products with a proven performance history. 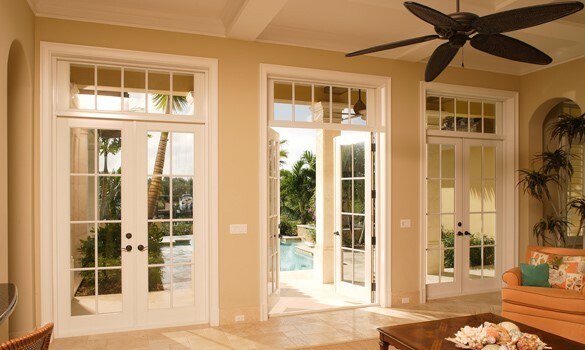 Whether you’re an architect looking to nail down the details of your custom home design or a homeowner looking to replace your inefficient components, our professional window and door consultants are ready to help. Contact us today to schedule a consultation. We’ll help you choose the right products for your budget and application, and you can rest assured that we understand the realities of building construction and Florida code compliance. Euro Wall Aluminum door systems offer a contemporary narrow sill appearance to open up your view with more glass and a clearer sight line due to narrower frame components. Multiple panel sizes up to 45 square feet. Panda lift and slide doors offer the more traditional warmth of an aluminum clad wood door with the contemporary narrow sill appearance. They have unparalleled detail designs for the most discriminating architectural designs. Custom configurations and colors complement the extreme size availability with panel sizes up to 60 square feet.